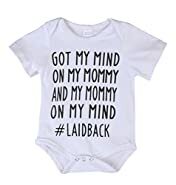 The Ladies I Have Arrived onesie for newborns, infants, and toddlers features a witty and unique front design that is sure to give you and other adults a chuckle. As each CBTwear baby onesie is made with only the finest, high-quality materials, your baby is sure to be at their comfiest, and they will not fall apart after a few wash cycles. On top of this, our bodysuits are environmentally friendly. We only use eco-friendly ink and they each come pre-washed in chemical-free, sensitive to skin detergent for your baby's safety. We are proud to say that each and every one of our products are designed and printed in the USA. Our meticulous printing process involves the transfer of the ink onto the onesie, resulting in a very high-quality appearance. We manufacture all of our bodysuits with 100% cotton for a soft and stretchy, yet durable feel. This means no irritation and all-day comfort for your munchkin. All of the items we carry are shipped from our facility located in Florida or from Amazon. 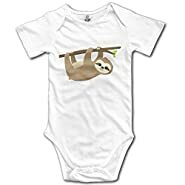 This Ladies I Have Arrived onesie makes an adorably awesome gift for anyone who has a baby, knows someone with a baby, or is expecting a new baby. You can gift it to an expecting mother at a baby shower, for a pregnancy announcement, any holiday, Mother's day present, or just because you feel like it! It doesn't just have to be for a new mom though. 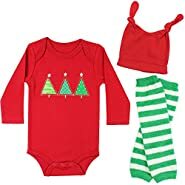 Little nieces, nephews, grandkids, cousins, and alike would all look their absolute cutest in this Ladies I Have Arrived infant creeper. We mentioned our Ladies I Have Arrived baby bodysuit is 100% cotton for ultra comfort and softness. The durable interlocking fabric is also long-lasting and fully machine washable. It has three easy snap buttons at the bottom for ease of access for fast diaper changes. The convenient envelope folds at the shoulders of the one-piece make it easy to pull over your baby's head, avoiding getting any sort of mess that's on the onesie on their face or head. Thanks to the 100% cotton fabric, our Ladies I Have Arrived baby bodysuit allows for all-day wear or all night sleepwear. The onesies we make are suitable for your little one to flaunt on any and all occasions. This can include casual, playtime, photo shoots, sports, special events, and more. 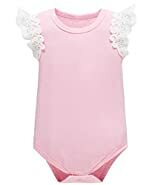 If you're wanting an outfit for your little one that is neutral looking, not too boyish and not too girly, our unisex baby bodysuit is a good choice. BABY FASHIONISTA'S AND FASHIONISTO'S: Keep your cutie stylin' with modern baby fashion fit for the times. 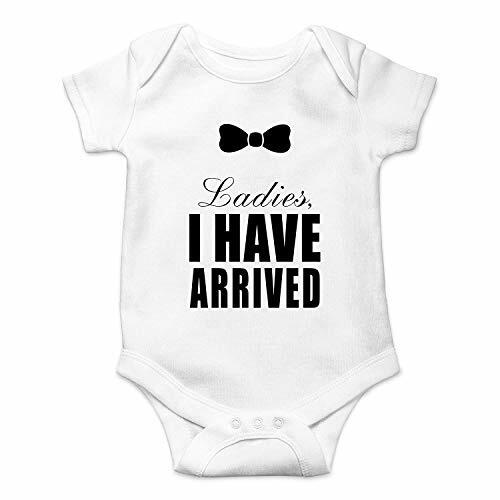 This stylish Ladies I Have Arrived onesie will have you and other adults wishing there was one in your size! In addition, it allows for your baby to communicate thoughts through fashion, as they are still in the learning-to-speak stage.